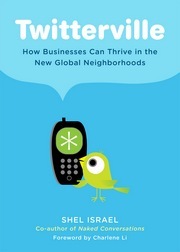 Twitterville, How Businesses Can Thrive in the New Global Neighborhoods [Portfolio, September 2009] is Israel’s newest book. It tells the stories of more than 100 people Israel has interviewed in all aspects of business ranging from home office to global enterprise. It tells you about accidental citizen journalists who happened to be present when a plane landed on the Hudson River; when an earthquake devastated Szechwan, China; and how people with causes have raised money from thousands of people, sometimes in just a few hours and how government is starting to use Twitter to be both more efficient and responsive. Twitterville is intended to tell you how so many people have succeeded with Twitter, so that others can get ideas on how it may help them as well. Pre-order at Amazon, BN.com, 800-CEO-READ, Borders.com, or IndieBound. TBASH, the Twitterville book launch party will be held 4-8 pm, Sunday, Aug. 23 in the Hiller Aviation Museum. Space is limited so sign up now. Shel Israel's blog, Global Neihbourhoods. Shel Israel is a social media storyteller. He is co-author of Naked Conversations, and The Conversational Corporation. Read more about him here.